We land in Civitavecchia, Italy and board the Holland America Line Oosterdam that would be my home for the next 12 days. The first port on the itinerary was Livorno, Italy but I had pre-arranged with a local guide to take us to Lucca, an ancient medieval Tuscan city that has been on my bucket list ever since I learned there was a Saint Zita from the 13th century who lived and died there and whose mummified body is on display to this day! 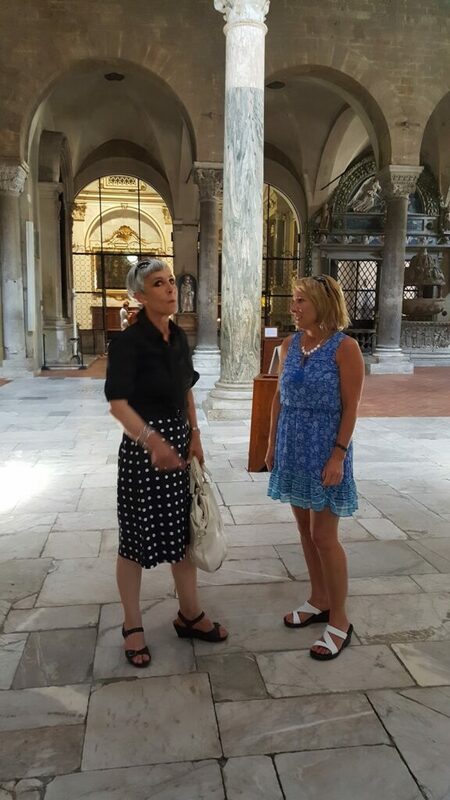 I first meet my wonderful guide, Wanda Martinelli of Tours By Locals, and head to our first appointment with chef Giuliano Pacini of Buca di S. Antonio, a long established and very popular traditional Luccan restaurant. He wants to show me their methods for making pasta and so I am taken to their small and very warm kitchen where I find Chef Monica ready to cook (according to Giuliano, women are better pasta makers so he never makes it himself 😊). I watch Monica do all the hard work while the Chef tells lots of entertaining stories that helps keep my mind off how hot it was in the kitchen. I am then treated to a terrific pappardelle with porcini mushroom sauce that was quite flavorful yet subtle, and was paired perfectly with a super tasty local red wine thanks to Sommelier Cristiano. Chef Giuliano insisted that my crew and I stay for lunch and we devoured more pasta with a rabbit ragu, fresh bread & olive oil and a refreshing rosato to complete the feast. Next – the real impetus for my visit, Basilica ano de San Frediano to see the famous Saint Zita. This imposing Romanesque church is quite beautiful with its marble interior and many intricate chapels. I head straight to St. Zita’s chapel, where the Patron Saint of Maids and domestic servants is entombed in glass display for all to see. The story is that she was a maid for the wealthy Fatinelli family and they believed she was stealing bread to feed the poor. When stopped one day and asked to open her apron thinking they would find bread, instead it seems that flowers fell out. Her life is celebrated with a feast every April 27th and while I don’t know if I’ll ever be in Lucca for that event, simply visiting her now meant a lot to me (I got quite emotional). We drove into the hills of Lucca and came to the stunning grounds of Fattoria di Fubbiano, a winery surrounded by olive groves and vineyards. This impressive property has recently added a new wine cellar and tasting room with temperature controlled steel tanks, large wooden barrels and concrete vats, with eash serving a unique purpose for certain styles of wine. I met with winemaker Marco in the barrel room where I was honored to taste a Sangiovese straight from one of the small French oak barriques. He told me it was his first time tasting it since it went into the barrel just a few months prior. I have to say it was already quite delicious despite being so young. The winery produces 100,000 bottles of wine per year, protecting the local traditions and styles of the Colline Lucchesi while continually striving to make their wines even better. I liked the fruitiness and easy-to-drink style of their wines. If only I didn’t have weight restrictions on my luggage I would have grabbed a few bottles to take with me. 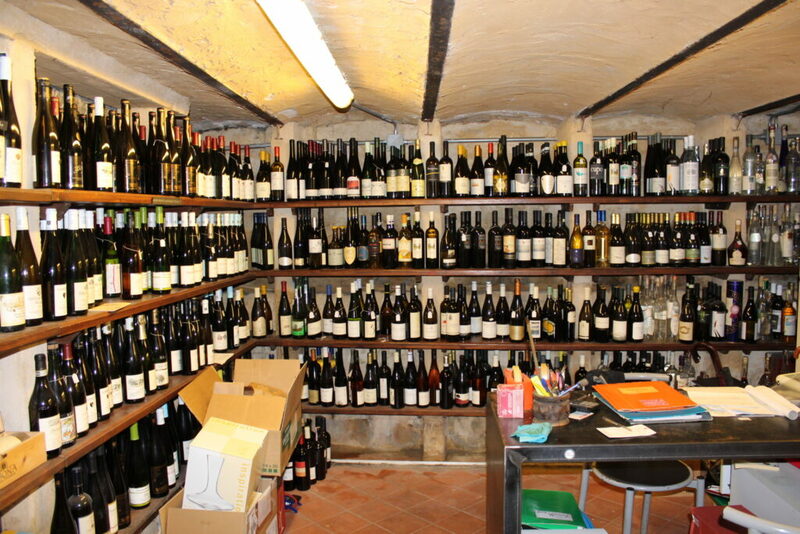 Now that my taste buds were whet, we head to one of Italy’s best wine shops, Enoteca Vanni, a wine ship with over 55,000 bottles of wine are for sale. The shop itself is rather tiny with just a few shelves lining the walls, but walk down a few steps and you enter an endless cave filled with wine, whiskies and all kinds of treasures dating back years and years. I was hoping to get a sample of some of the wines but that wasn’t in store for me on this day. Instead I purchased something special to enjoy back home and to celebrate my patron “name-saint”. Next stop, Barcelona, Spain. I had been here once before, 15 years prior when my son was just a little boy and I really loved it. I hoped I’d feel the same way this time. A very helpful part of this cruise itinerary was that the ship would be staying in port overnight so this meant I could go back there to sleep and wouldn’t have to rush off to the airport or find a hotel after a day of drinking and dining. It also meant a bit more time to enjoy this exciting city. My time would be spent with Yves Nicolier, a local food guide and “social cooker” (as he calls himself.) Yves runs cooking classes, caters, hosts dinners and basically, loves bringing people together to cook and eat. Today would be my turn and I was ready to see what we would be doing. 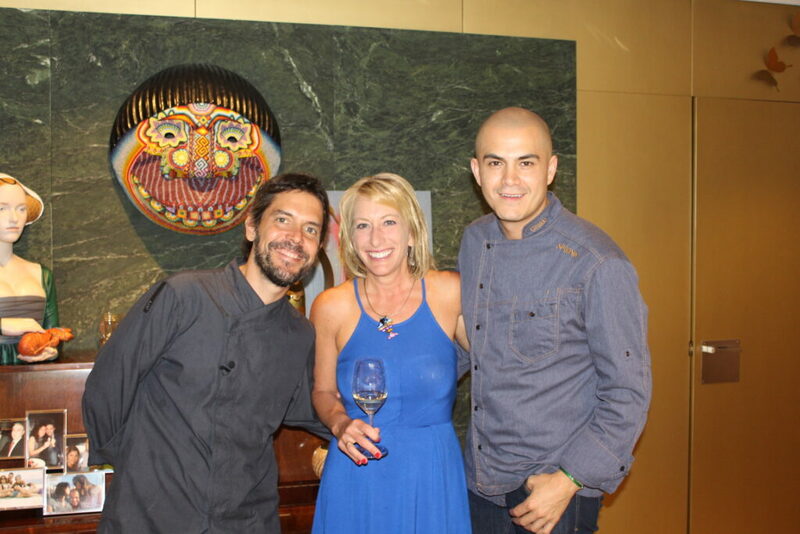 We headed to the restaurant Spoonik, a modern and very original dining place opened by Chef Jon Giraldo and Jaime Lieberman. I was given a glass of Cava to sip while waiting for Chef Jon to arrive, a pleasant start to this visit. When the Chef came in, he quickly moved into the kitchen and invited us with him. He explained that he always includes his guests in the kitchen to observe his first dish. Today he made a vegetarian ceviche with mango and olive oil caviar (and Corriander chips!). He sat down with us and popped open a bottle of his favorite Champagne while we talked about the restaurant and his love of cooking. While we sat, he whispered something to one of his colleagues and suddenly, the overhead lights dimmed, the table lit up with color and the sound of thunder and rainstorms filled the room. This unusual event is one of the scenes that can be projected while you are eating here. 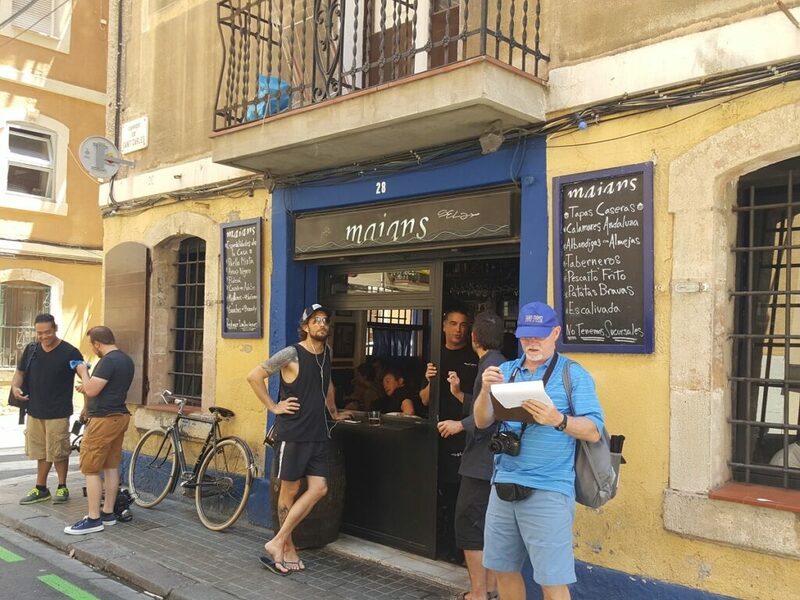 Yves had a friend with a Harley and sidecar, so we head out for tapas, so we head back to the Barceloneta waterfront area and a tiny looking restaurant called Maians. The place was PACKED and we struggled to find a spot to stand while Yves and the owner discuss what dishes we should eat. Dish after delicious looking dish eventually arrive and it all looks mouth-watering. There’s a salad of tuna, codfish and anchovies in Romesco sauce, (made with tomatoes, garlic, almonds hazelnuts & a small round red pepper that I don’t remember the name of), a marinated white fish (Yves says, a mini shark) floured and fried into nuggets, a traditional looking paella (yum) and then another paella that’s a special round rice with cuttlefish ink, clams and an aioli sauce. That dish was absolutely fabulous- salty but creamy and impossible to stop eating. Our final stop is at Yves’ place, a home located just outside of Barcelona with rooftop views that are spectacular. There I take a cooking lesson to learn how to make Romesco sauce with codfish we had earlier. Smoked paprika and nuts…delicious! To close the day, we head up to his rooftop with a glass of wine and our food and finish our day spectacularly.